Here you can find all steps to setup the connection between Rydoo and Exact Online, how to choose the right connection settings and to export the data from Rydoo towards Exact Online. Choose Exact Online and click on the blue 'Connect'-button'. Choose the country of your Exact Online account. Fill in your login details and click on 'Login'. We will import your 'Chart of accounts' to the categories in Rydoo. We will import your 'Projects' if you have the project module activated in Exact. It is possible to use 'cost centers' and 'cost units' as well. Cost units: To set this up you need to create a custom field in Rydoo and name it 'costunit' or 'kostendragers' (for our Dutch users) with predefined values. Make sure the cost unit code within Exact Online is equal to the custom field code within Rydoo. 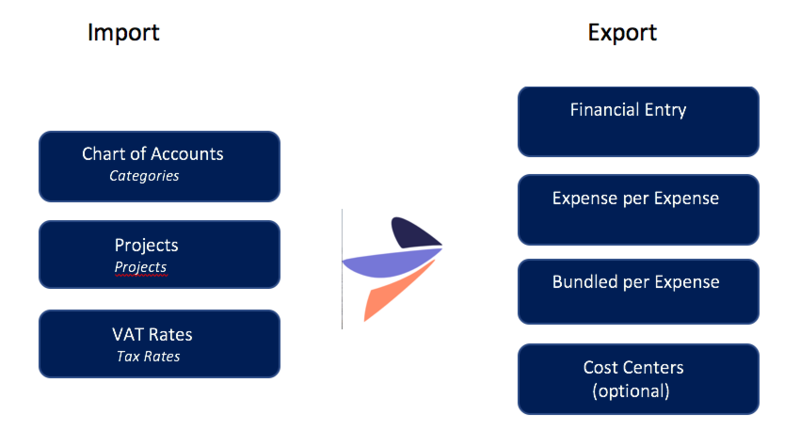 When creating an expense, you will be able to select the cost unit you would like to have the expense linked to. Choose the branch from Rydoo (your company/branch) that you would like to connect with Exact Online. Choose the Company from Exact you like us to connect with. Choose the Journal where to you want to export your expenses. TIP: Make a separate logbook in Exact Online e.g. : 'Expenses Rydoo' to keep a good overview of all your receipts. Click on save and synchronise to make sure your settings are ready to work with. 1/ create an expense line with the name of the Rydoo user as a supplier. We have an additional feature which allows you to bundle reimbursable expenses per user. If this option is selected, we bundle all these expenses and place them under the employee as a supplier. Company expenses: For company expenses, it is important that a company card is added in Rydoo (Admin settings / users => select user profile => payment methods). These payment methods can then be linked to a specific bank account (or also supplier in EOL). This functionality is used to link all the non-reimbursable expenses to one specific supplier (e.g. Mastercard/ Visa or User X) so that expenses can easily be reconciled.